… the english language international webpage of the Meikakukai association. 2016.10.30. – The Kyoto Aiki Camp has successfully finished. The biggest annual event for all Meikaku-kai members, The Kyoto Aiki Camp, was held from 14th October to 16th at HQ Dojyo in Kyoto. In this highly intensive 3 days’ program, the Aiki brothers and sisters from all over Japan and overseas enjoyed training and party to deepen the skills and friendship. In next year, 2017, the Camp will be held in October. The detailed schedule will be on this site when it is confirmed. Meikaku-kai 15th Anniversary events are just around the corner!! Every autumn, the members of our society get together at Kyoto HQ Dojyo to have Aiki Camp. This is the biggest annual program for us all and not only Japanese members but also overseas members join it. This year is the special year for us. Yes, we have 15th anniversary for the society. As the events for this, there will be held Aiki Camp, Cerebration Party and Journal Publication. The exact schedule is below mentioned. 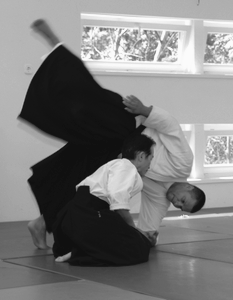 Every autumn, we have the Special Aiki Camp at Kyoto HQ Dojyo. For the Camp, the Aiki Brothers and Sisters get together from all over the world. The new international webpage has been launched where you can find the date for Meikakukai Japan. Please follow the page to get the latest information on the happenings!